I have been looking for a good offsite backup tool/service that works with Linux. I see that a lot of people use Mozy or Carbonite. The challenge is that those tools do not support Linux. I read an interesting blog post today. 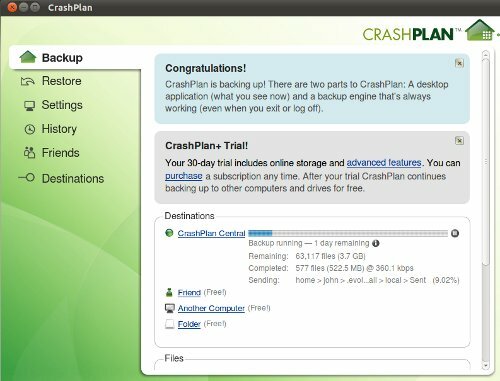 There is a service called "CrashPlan" that provides your standard online/offsite backup. The interesting part is that they support Windows+Mac+Linux+Solaris. I setup a free 30 day account today so that I can try out the service. If it works ok I will end up buying the family plan... aka: 2-10 computers and unlimited storage. I downloaded the Linux client and installed it on my workstation running Ubuntu 10.10 64bit. You run the install script, answer a few questions, then you will need to reboot the computer, and after the couple of minutes that took to do the install you are in business. It will backup local disk, external drives, and NAS. I setup a subset of my home directory for a backup and excluded the crazy large portion of my NAS mount. It is running right now and will take a day or so to complete. At first glance it looks like an ok service. It will run attended or unattended, it covers a several OS types, and they have a family plan. So far... I am interested and hope that this work out. I would like set this up on all of the PCs and laptops in the house.